PICTURE a reader bookmarking your site. Adding your site to their RSS feed. They’ve come across one of your links on Twitter. Something about it struck them, compelled them, and was relevant to their interests. They clicked on your link. And another. And another. They shared your posts, and now others are coming to your site. It’s a pretty awesome thing to imagine, isn’t it? Increased website traffic is something you desire as a website owner, right? Maybe even obsess over a bit? It might be the solution to a problem you have been having. It’s emotional. It’s important. It’s vital, because website traffic is what keeps your business thriving. That’s why I’m going to share 15 (plus a bonus) of the best ways to attract more website readers. You see, it’s not enough to just get more pageviews. Instead, you want actual readers to come to your site. Having just fifteen people visiting your site, engaging with your content, and signing up for your email list is way better than having two hundred people who visit your site and leave without engaging at all. While you don’t necessarily need to hire a graphic designer (although doing so is highly recommended), you do need a website that looks professional, is easy to navigate, and that has an obvious brand. There are plenty of free platforms available, especially when it comes to creating a blog for your business. However, it’s better to move to a more professional platform like Squarespace or WordPress. Using a platform like those will not only make your website look more professional, but also makes it easy to modify them to represent your business and your brand. They are highly customizable, which is necessary if you are serious about attracting more website readers. Not only should the design of your of your website be easy to navigate, but it also needs to be properly branded. This will help you stand out from the rest of the businesses within your niche and, ultimately, will lead to you attracting more website readers. Facebook is one of the best promotional tools available, regardless of whether you are in the B2B or B2C industries. One of the best ways to get the most out of this platform is to set up remarketing audiences in Facebook. It sounds a bit complicated, but it’s actually quite straightforward. Just install a Facebook tracking pixel on your website, and you will be able to market to the readers who have visited your website. This is an excellent way to keep readers coming back to your website, and your audience doesn’t even have to be gigantic in order for you to start doing it. Once you hit 100 visitors, you can start remarketing in Facebook. Aside from remarketing, you can also use Facebook to boost your emailing list. Rather than sending out an email campaign every now and then, you can upload your email list to Facebook and get the social accounts of anyone who has shared their email address. This will make it far easier to market to readers who primarily use mobile devices, as opposed to their PC. One of the most effective ways to attract more website readers is to create a blog full of value-driven content. Consumers are far more likely to buy the products or services of a brand they know and trust. Blogging creates a sense of community, and makes it easier for your customers and clients to trust your brand and business. In fact, businesses with blogs receive nearly 130% more lead growth than those without a blog on their website. Having a blog for your website also increases your amount of indexed pages, which boosts your website’s visibility. On average, companies that blog receive 434% more indexed pages than companies without a blog. Sharing your website’s blog posts across social media platforms will also significantly increase your traffic generation and attract more website readers. Do keep in mind, though, that you want to write with your ideal reader in mind. Make sure your content will benefit your reader and help establish your authority within your industry. Even sharing a bit of a personal story about your business (as long as it is relevant to your readers) will help consumers to better trust your brand. Adding a personal story about your business will humanize your brand, which allows readers to better connect with you on multiple levels. Twitter is one of the most effective social media platforms available when it comes to marketing your business. Twitter Cards is an excellent way to attract more website readers. Since they are larger tweets that allow you to add images and buttons, you are able to get better results. Tweets with images have proven to get a much higher percentage of clicks than Tweets without images, so Twitter Cards will definitely boost your visibility and drive traffic to your website. Optimizing your site will make it easier for search engines to crawl your website. This will give your search engine rankings a boost, and increase your website’s visibility. Some website platforms, such as Squarespace, have already taken care of most of the SEO for you. Even if your website platform handles the technical side of the optimization, it’s still important to make sure your website content is SEO-friendly. This means double-checking that the titles, headers, captions, anchor links, and written content all include popular search terms, since this will make it easier for readers to find your website. Social media is a great way to get your brand noticed and attract more website readers. Social media includes RSS feeds, blogging, and social platforms like Twitter and Instagram. Utilizing these social channels will help ensure your brand reaches a wider, more varied audience. Sharing your posts through different outlets also promotes your content, and is likely to result in other users “liking” and sharing that content. One of the best ways to utilize social media (aside from directly sharing your links) is to have buttons and/or links on your site. This way, people can share the content they find on your site. An excellent way to attract more website readers is to develop working relationships with other influencers within your industry or niche. This can be done through guest posts, sharing their content, or talking about them on your website. You can also network with others by going to conferences, since they are great opportunities to meet people who are interested in things that are industry-specific. You will be able to find others who can offer valuable advice, connections, inspiration, and joint project ideas. Since it can be a bit nerve-wracking to meet people in a formal networking setting, you may want to check out other ways to network with your industry peers. You could volunteer in your community, working on behalf of your business. 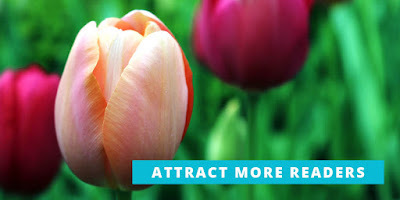 Potential business connects will see you making a positive impact on your city or area, which reflects positively on you. When trying to build consumer-company relationships, or even consumer-consumer connections, this positive reflection will come in handy. It’s critical to have a clear and concise title, and this will go a long way when it comes to attracting more website readers. If you post a link to your content, as well as that page’s title, you want the title to tell the reader what they will be reading – but in an eye-catching, “I have to read this” type of manner. Just as importantly, you want to avoid click-bait headlines that have nothing (or very little) to do with the content. Approximately six out of ten people in a recent study confessed they had only read news headlines within the past week. The numbers are far likely to be higher, but many people are shy to admit to only reading the headlines. It is because of these statistics that so much care must be taken when crafting a headline for your own content. Make sure yours immediately grabs a reader’s attention, but also make sure your content holds up its end of the deal. Paid search, social media ads, and display ads are all great ways of driving traffic to your website. All of these build up your brand, and get your business noticed by a wide range of people. For businesses that wish to attract more website readers, investing in a pay-per-click campaign is the optimal marketing strategy. In fact, most businesses now spend a large chunk of their marketing budget on just paid searches. While doing this can prove a bit risky for small businesses, this method is often considered to be highly effective. If you want more website readers who are likely to result in sales, focus on high commercial intent keywords as part of your paid searches. The competition is high, but the results definitely prove the investment is worth it. Long-tail keywords are extremely important to a website’s SEO, and are highly effective for traffic generation. Long-tail keywords or those short phrases (three to four keywords) that are specific to whatever it is you are selling. When a customer uses very specific search phrase in a search engine, they are more than likely going to find what they are looking for. Make sure they find you. Long-tail keywords make up the vast majority of search engine searches, so including them as part of your paid search or SEO efforts will definitely pay off in the end. Include the long-tail keywords relevant to your business within your headlines, meta tags, image captions, and actual page content. Serving as a sort of electronic business card, LinkedIn has more going on than just being a place to find a job. It’s actually the world’s largest professional social networking platform for professions of all sorts. This means the site is a great source of traffic for yours. The effectiveness increases even more when you dedicate time to go from just networking a little to actively marketing yourself and your company. Posting content to LinkedIn on a regular basis will attract more website readers, as well as give your industry profile a boost. You’ve undoubtedly learned about the importance of getting sites to link back to yours, but you may not have known internal links are just as important. These are the type of links that create a chain from one page on a domain to an entirely different page on the same domain. They are commonly used in navigation, such as when a reader goes from Home to Blog on a website. Internal links are important because they allow users to navigate a site, establish informational hierarchy, and help boost your SEO ranking. When creating and sharing content, make sure to include relevant internal links when you can. Not only does this help your SEO strategy and structure, but it also gives the reader a more useful, value-driven experience. In addition to driving traffic to your website, this will also keep readers on your site for a longer period of time. With a large number of internet users reading content on mobile devices, it’s important that your website be optimized for both mobile and PC. Many website platforms (like Squarespace) will have this design component built in. If not, this is definitely something you need to pay attention to. If someone cannot easily navigate your page, or finds it to look jumbled and not aesthetically pleasing, they will likely leave. Email marketing is an important tool, since even a small email blast can result in a dramatic spike in website traffic. In fact, email remains significantly more effective than social media when it comes to marketing a company and acquiring more customers. While you don’t want to throw a relentless amount of emails at people, you do want to be sure to take advantage of this method of advertising. A friendly reminder about your latest product or service is a great way to boost your website traffic, and makes it easier for consumers to know and trust your brand. Word of mouth is one of the most effective (and affordable!) means of advertising your business. By using testimonials from satisfied customers – regardless of which format you choose – you advance your sales pitch to a higher level of credibility and unbiased recommendation. Collect glowing reviews and testimonials from previous clients and/or customers, and share them on both your website and social media channels. Adding these testimonials is probably one of the easiest ways to attract website readers, and is sure to boost your company’s selling power. When sharing them across social media, include a link back to your site. This is a great way to boost your traffic and attract more website readers. It’s pretty important to visit at least a few different websites within your industry niche on a regular basis. Next time you’re doing this, try joining the conversation! While commenting won’t result in an immediate influx of new website readers, you will get your brand noticed. Leave insightful, value-driven comments on blogs and sites within your industry – at least a paragraph or two – as a way to get your name out there. This often leads to more traffic being driven to your site. Just remember to maintain standards of excellence, and keep your comments professional, relevant, and of high-quality. Engage with other people, but don’t self-promote or fill up the comment section with spam. That may result in a spike in website traffic, but it will likely be negative attention. The task may seem daunting at first, but it’s actually easier than you may think to attract more website readers. These tips are a great way to increase the engagement of your viewer, so sit down and get started! While you’re at it, feel free to share some of your own ideas and successful tips that have helped boost your website’s readers!